Spyderco's Sage series is a family of folding knives that honors the pioneering designers of our industry. Every member of the Sage family features a flat-ground, leaf-shaped CPM S30V blade, an ergonomic handle design with textured forefinger choil and thumb ramp, and a reversible tip-up wire clip. Each Sage showcases a specific lock mechanism paying homage to the trendsetting knifemaker or designer who invented it. Proceeds from the sale of every Sage folder are donated to the Alzheimer's Association, Colorado Chapter. The Sage 3 pays homage to the late Blackie Collins and his groundbreaking Bolt Action Lock. This revolutionary lock design consists of a spring-loaded steel bolt that wedges between a ramp on the tang of the blade and the inside of the handle back strap. Retracting an ambidextrous button releases the lock to close the blade. 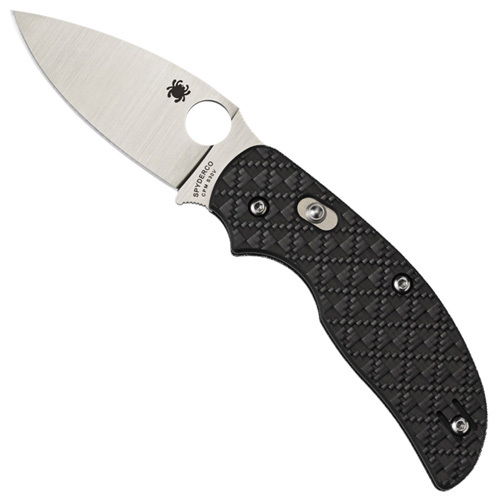 The new Sage 3 features a black cubic check carbon fiber/G-10 laminate handle.